Whether convenient, fast, organic, processed, gourmet, ethnic, or local—the foods available to Americans have never been more plentiful and diverse, or more ripe for discussion. 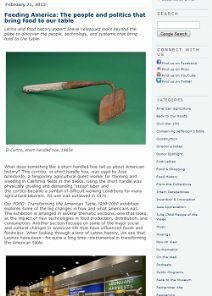 Coupled with big changes in who does the cooking, where meals are consumed, and what we know (or think we know) about what’s good for us, the story of Americans and food in the last half of the twentieth century is about much more than what’s for dinner. This exhibition at the Smithsonian’s National Museum of American History explores those changes and some of the factors—new technologies, influential people, and broad shifts in social and cultural life—behind them. The French-born artist Jean Charlot spent his early career during the 1920s in Mexico City. 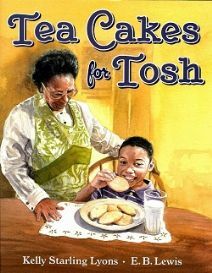 This touching story about Tosh, his grandma, and her recipe for tea cakes, reflects how food can connect people to each other and to the past.